In the weekend 29-30 April 2017 tunnel element no. 1 (with a length of approx. 100 m) was floated out of the construction dock (building pit on Marieholm Side) into the Göta Alv River. 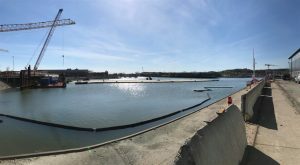 The 25,000 tonne concrete element took seven months to construct in dry dock. The building pit has been prepared for the construction of element no.2, currently on-going.